Former Brazilian President Luiz Inacio Lula da Silvaregistered his candidacy for the country’s upcoming election while imprisoned Wednesday. 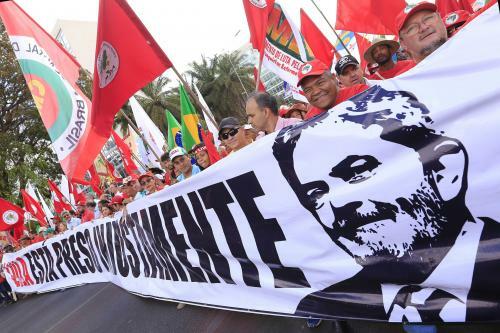 Brazil’s Worker’s Party formally registered Lula as its candidate as an estimated 10,000 people gathered outside the electoral court in Brasilia chanting “Lula for President” and “Free Lula” in support of his presidential bid, police said. Despite leading the polls and receiving the backing of his party and its supporters, Lula’s bid is unlikely to be accepted as he serves a 12-year jail sentence for corruption and money laundering. Under the country’s “clean record law,” politicians whose convictions are upheld on appeal are prohibited from running for office. Lula’s vice presidential candidate and former mayor of São Paulo, Fernando Haddad, is expected to replace Lula as the party’s nominee if he is barred from the race. Hadad placed fifth in a polling scenario that excluded Lula with 6 percent of the vote, while right-wing retired army Capt. Jair Bolsonaro led that poll with 21 percent.